There's a newly viral video online that shows a girl crying over boyfriend named Jimboy who apparently broke her heart for someone else. And she's not taking it easy, crying uncontrollably while her best of friends trying to comfort her. 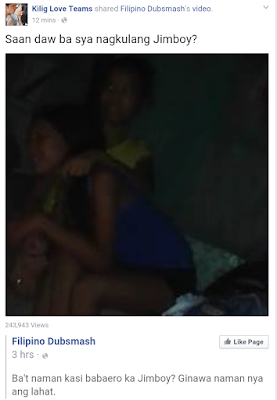 It's either you feel sorry for the poor girl, or you get entertained by what she's saying in the video. Saan daw ba sya nagkulang Jimboy? Now who's that heartbreaker Jimboy who left the girl's heart aching so bad? Definitely, it's not PBB 737 Big Winner Jimboy Martin nor the late ex-boyfriend of Mahal, Jimboy Salazar. But whoever he is, he must let the world knows why he left the girl even she already gave it all haha.